1 Telephone companies (market share): Tigo (45%), Claro (25%), Movistar (24%), Digicel (5.5%), Red (0.5%). 2 The United States dollar is the currency in use. Financial information can be expressed in U.S. Dollars and in Salvadoran colón, but the colón is out of circulation. 3 On the Coat of Arms of El Salvador, the country's name is written "Republica de El Salvador en la America Central", Meaning "Republic of El Salvador in Central America"
↑ Baker, Brent. (2009-03-09) CNN Correspondent Now the Communist Candidate in El Salvador. NewsBusters.org. Retrieved on 2012-07-28. ↑ Mauricio Funes Installed As El Salvador's First Leftist President. Huffingtonpost.com. Retrieved on 2012-07-28. 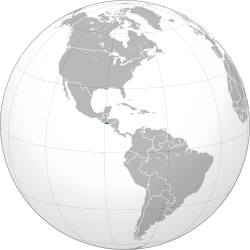 ↑ "UNdata El Salvador". UN. 2008. http://data.un.org/CountryProfile.aspx?crName=El%20Salvador. Retrieved 2010-07-04. ↑ ୫.୦ ୫.୧ ୫.୨ ୫.୩ "El Salvador". International Monetary Fund. http://www.imf.org/external/pubs/ft/weo/2012/01/weodata/weorept.aspx?pr.x=105&pr.y=18&sy=2009&ey=2012&scsm=1&ssd=1&sort=country&ds=.&br=1&c=253&s=NGDPD%2CNGDPDPC%2CPPPGDP%2CPPPPC%2CLP&grp=0&a=. Retrieved 2012-04-18.